Kitesurfing is an extreme sport. It has its risks. It is important to understand the basics properly through as series of lessons so that you know about the safety procedures and conditions. The right weather conditions and surroundings and up to date equipment are a must. Never go kitesurfing on your own. What are the right weather conditions? You need at least 12 knots of wind, that’s a small 4 Beaufort. For beginners it is wise to practice with an average wind between 12 and 20 knots. When you are experienced you are able to handle more, depending on your weight. It is dangerous to go kitesurfing with offshore winds. This depends upon your experiences in other sports. Some people think you can kiteboard after a package of just 3 lessons. This should be the very minimum to consider. Most people will need to practice for many hours before they can ride upwind. Where can I go kitesurfing in Holland? Kitesurfing in Holland is only allowed in designated kitesurfing zones. If there are no signs then it is not allowed. How many lessons are needed to go kitesurfing? It is wise to take a minimum of 3 lessons of at least 3 hours each. In those 3 lessons it is possible to go through all the safety procedures and to get enough practical training. However, you must be aware that this is a minimum. It depends upon the weather conditions and your level of skill as to how fast you will learn. It’s important that you and your instructor are both confident that you can go on by yourself before you actually do so. It is possible to kitesurf in a simple way or you can make it very difficult for yourself. It depends upon on the prevailing conditions and your skill level. At what age is it possible to get kitesurfing lessons? From about 11 years old a child is usually sufficiently developed to be able to understand the basics of kitesurfing. They need to be taught thoroughly and carefully and be given as many practical tasks as possible. It is best to have lessons with someone of the same age or alternatively have 1 to 1 private lessons. This is also because you should not have too much of a weight difference within a group during a kitesurfing lesson. Is it allowed to kiteboard outside of the kite zones? No, in Holland this is not allowed. Am I insured whilst kitesurfing? Kitesurfing is an extreme sport and with a lot of insurance companies it is deemed a special sport. So it is important to check out with your insurance company whether you are covered and, if so, what the level of cover is. If you don’t have cover but are reading these kitesurfing faqs then you are probably serious enough about learning the sport you should look into obtaining cover. What kind of kite do I need to buy? 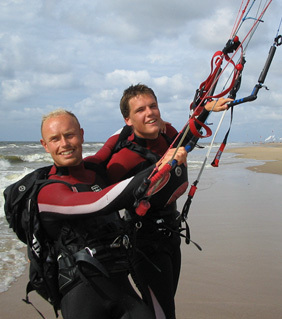 In 2005 the first bow-kite came onto the market. This was a lot safer kite than the original C-shaped kite. As a beginner it is always best to buy a kite with a lot of depower. The additional benefit is that you cover a lot more wind forces with one kite, so you need to buy fewer kites. After the bow-kite, similar kites came on the market with the same technique – such as the SLE (supported leading edge), hybrid- and delta-shaped kites. They all have a bridle that holds the leading edge and this makes it possible to depower the kite a lot. Also the newer C-kites are a lot safer since they added a fifth line that also holds the leading edge. Nevertheless, the flatter shaped bow-kites are easier to relaunch and have a bigger wind range. For more specific advice consult a specialist shop or kiteschool. Which sports make it easier to then learn kitesurfing? It is good if you are used to handling a lot of power and speed. That way you won’t be too surprised with the power of the kite. Any water or board sport has similarities with kitesurfing. Experience in any one of those sports can be a help. Kitesurfing is pretty much a combination of flying a kite with surfing or wakeboarding. It is definitely worth flying a little kite on the beach and doing some wakeboarding before or in between your kitesurfing lessons. Can anyone learn to kitesurf? Thanks to the revolutionary development of techniques in kitesurfing it has become a much more accessible sport for many people. Nevertheless, you are still playing with a lot of power and there are theoretical circumstances that need to be fully understood in order to be safe. There will always be some people for who it does not work out – they are simply good at other things, just not kitesurfing!